Something amazing happened 400 years ago in Renaissance Florence. At the turn of the 17th century, in one of Italy's greatest cultural centres, a group of intellectuals and musicians focused their creative powers on achieving the impossible: the resurrection of Greek tragedy. They failed, but in the process created what we know today as opera. The theme their efforts focussed around, set most famously by Claudio Monteverdi, was the Greek legend of Orpheus and Euredice. It has been an enduring favourite, and one which composers of the last 4 centuries have often looked back to for inspiration. John Caldwell, venerable Oxford professor and composer, joined the A-list yesterday with the first performance of his work "The Story of Orpheus", premiered in the beautiful New College ante-chapel. The story will be a familiar one to many: the lovely Euredice (Kate Semmens) is out walking in the meadows when she is set upon by an overly-amorous shepherd, Aristaeus (William Rolls). She runs from him, and, in her haste, does not see the poisonous serpent lurking in the grass, whose bite kills her. Her lover, Orpheus, is inconsolable. He vows to use the famous power of his lute to charm the god of the Underworld, Pluto, into giving her back. 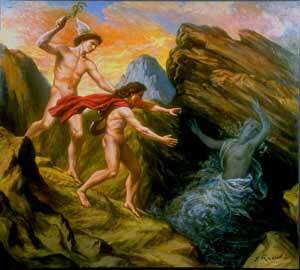 Orpheus succeeds, under the condition that he does not look back at Euredice until they have reached home. Simple enough, you might think. But, beset by doubts that he has been tricked, Orpheus cannot resist a glance. And the rest, as they say, is history. Its probably a good idea to get this over with now: the music was inspired and the cast and orchestra were excellent. Sorry to disappoint anyone looking for biting sarcasm or an all-too-soft target, but every part was sung with élan, the orchestra rocked (technical term), Stephen Rice's conducting was serene, and the singers even acted convincingly. Counter tenor Iestyn Davies was particularly outstanding as Orpheus, as was Mike Davis' Pluto, who held a serious amount of stage presence along with his warm bass tones. And the music? It had, to coin a phrase, something for everyone. For the music buff, there were cheeky quotations galore, including some references back to the original Monteverdi's Orfeo. It sounded brilliant, with some exquisite duets and trios peppering the classy texture. Caldwell is a composer that really stands out from the crowd, with his mature, confident style. His previous big work, "Paschale Mysterium" wooed audiences and critics alike; "The Story of Orpheus" deserves to do the same, and more so. There are no plans in the pipeline to record this work yet, so if you want to catch it, you'd better hurry to tomorrow's performance before the last tickets sell out.